The Accella Keel is an innovative sit to stand computer workstation with hand crank adjustment and a graceful keel shape-just like a sailboat's. This flexible workstation offers ample room for a large computer monitor, with room to spare for important paperwork that must be kept close at hand. 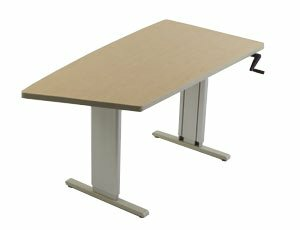 The Accella Keel workstation adjusts from 27-39 inches in height, providing a comfortable and productive surface level for seated or standing work. A patented hand-crank system smoothly raises and lowers the work surface and folds out of the way when not in use. Sturdy metal legs are graphite silver. The durable laminated worksurface is available in a left-hand version (shown) or right hand version.